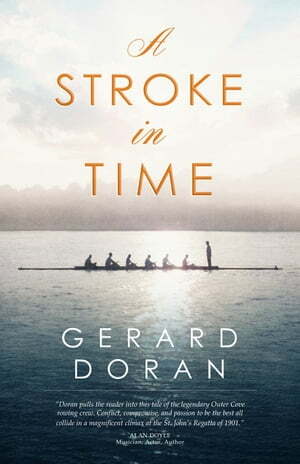 Collins Booksellers - A Stroke in Time by Gerard Doran, 9781771174602. Buy this book online. John Whelan, champion oarsman, has all but given up on competitive rowing. On the cusp of forty, the Outer Cove fisherman is trying to accept that his time as a rower has passed. His wife agrees, telling him, “Breaking your back down on that pond, that’s a young man’s sport.” But a fracas with the Torbay rowing crew in a St. John’s tavern rekindles his desire to beat his long-time rivals in the upcoming St. John’s Regatta. With the regatta just ten months away, can he and cox Watt Power assemble a championship crew in time? The answer is the stuff of legends. A Stroke in Time is Gerard Doran’s debut novel. Inspired by true events, this tale of the record-breaking Outer Cove rowing crew of 1901 is a tribute to the everyman hero and a dedication to the outport fishing culture of more than a century ago.